Dunno why I thought it was part of WOTOG set. Wait. Did this card always have summon and attack voice lines? I opened and tried it in some decks but I can't remember any voice line. dane's been using it in big rogue with Silver Vanguard and Kobold Illusionist. 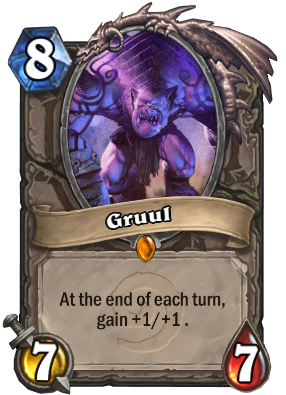 Nice to see a legitimate use for Gruul, even if it's just for the meme. Open his golden version just 5 minutes ago,must i be happy? or be disappointed? I just opened golden too. You must be very disappointed. This card will NEVER see play. Should i disenchant this ? Great to get from Confessor Paletress. Especially against zoo because they lack hard removal. He is bad because any high cost minion has to impact the board the turn it is played, or it has to have a REALLY good effect (like Ysera, which is also not being played right now). Imagine an enemy zoo Warlock with a board full of minions. Would you rather: Play Tirion who has taunt, play Baron who clears the board, play Ragnaros who can clear a big minion or play Gruul who does... Nothing?